Series LY-R which adding a regeneration device is special for purifying all kinds of lubricating oil such as engine oil, hydraulic oil, mechanical oil, coolant oil, gear oil, and heat treatment oil and so on. This machine can not only rapidly remove water, gas and impurities from lubrication oil, but also remove the free carbon, deep oxides, acid, and pitch. So it can highly boost the oil’s value, making the oil more suitable for the lubricating system. 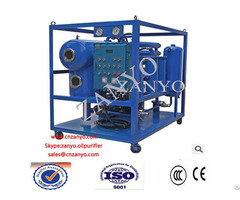 Business Description: Chongqing Zhongneng Oil Purifier Manufacture Co., Ltd owns a number of national-class oil purifier experts and experienced engineers. Encouraged by the company's modern management mechanism, we have developed six big series, including hundreds of models oil purifier equipments which have the independent property right and advanced filter technology. Those equipments can be applied to many fields, such as the electric power, petroleum chemical, metallurgical industry, mine, aviation, shipping and railway and so on.